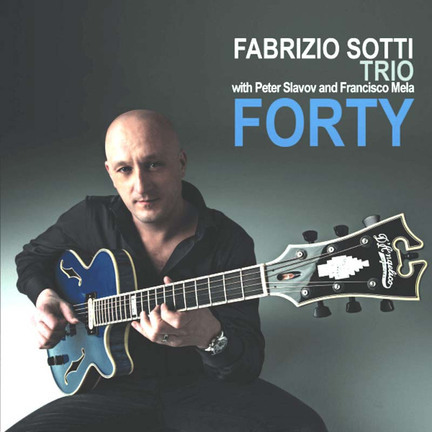 A kind of loose-but-tight intensity defines the performances on Forty, an appealingly varied program played by New York guitarist Fabrizio Sotti’s trio with Bulgarian-born bassist Peter Slavov and drummer Francisco Mela, from Cuba. Probably best known as a producer and sideman who’s worked with hip-hop, pop and jazz artists, from 2Pac to Cassandra Wilson, Sotti at 40 seems to be refocusing on his artistry as a guitarist and composer. His skills in both areas are impressively displayed here. Is the rambunctious title tune the Italian-born Sotti’s personal mission statement for his musical approach, right here and right now? If so, then he’s demonstrating to listeners his casual virtuosity, his natural feel for funk and swing grooves, his penchant for intuitive interplay and his skills as an arranger and a creative improviser. Stylistically, the trio covers a lot of ground on this set of nine originals and a Jobim tune. The three dig into blues terrain and textures on opener “Redemption,” the bouncy “Is That What You Think” and closer “The Bridge,” named for the Bridge of Sighs in Venice, and they nod in the direction of Monk with the zigzagging “Dangerous Walk.” Sotti turns to nylon-string guitar for the poignant ballad “Beginning Now,” followed by a breezy “How Insensitive,” featuring a buoyant, melodic solo by Slavov. They slip into a calypso groove on “Thalia,” named for the guitarist’s young daughter, and “So Far So Close,” for Sotti’s younger brother, is an intimate guitar-bass duo featuring another bracing solo turn by Slavov. All in all, Forty makes for a fresh approach to the guitar-trio tradition.